As I work on the physical plant at Ravenrock, I realize how the directive to use few machines changes the feeling of daily life. Machines are helpful but they have a strong energy and personality. Using very basic technologies is helping me feel less dependent and closer to the efforts and nature of my body. It is a strong learning. I wonder how comfortable I can be without fossil-fueled home life. There is no getting away from cars, at least not any time soon, but refrigerators, lights, stoves, showers and toilets running and flushing, can all be reconsidered. We have gotten very used to a domestic environment that zings, gushes, and shushes around us. All these require massive amounts of fuel and for this we are cooking the earth. Ravenrock is, in part, an Etude on what it feels like to step away from machines and toward the elements. Funding a project is a portrait of people's belief in that project. No one would have given money to this effort had not Dancemeditation touched them or given them value in their life. 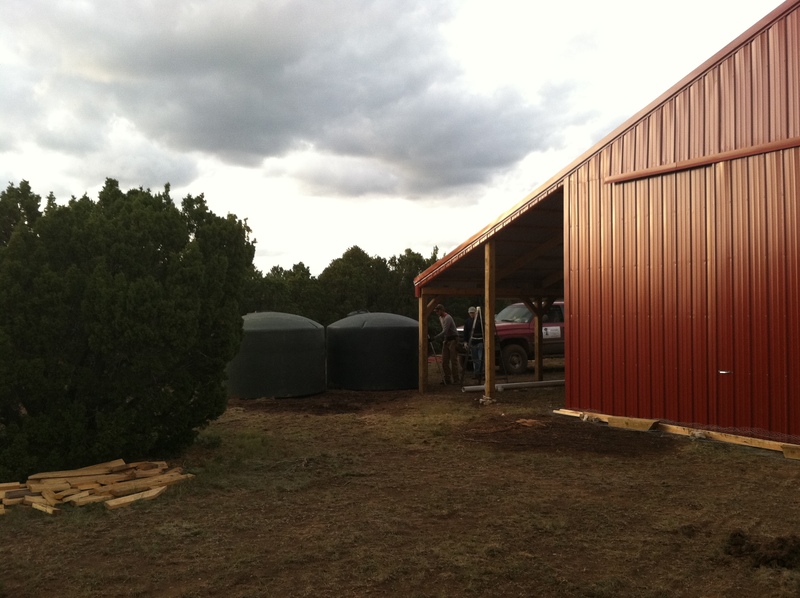 Ric and I drove around to the Bill Pyles’–Volunteer Fire Chief– house in tiny Romeroville to purchase a second 1600 gallon cistern. (We already had one lurking near the barn.) It was too big too strap to our truck so Jamie hauled it the following evening once again through mud. He is good at mud driving. 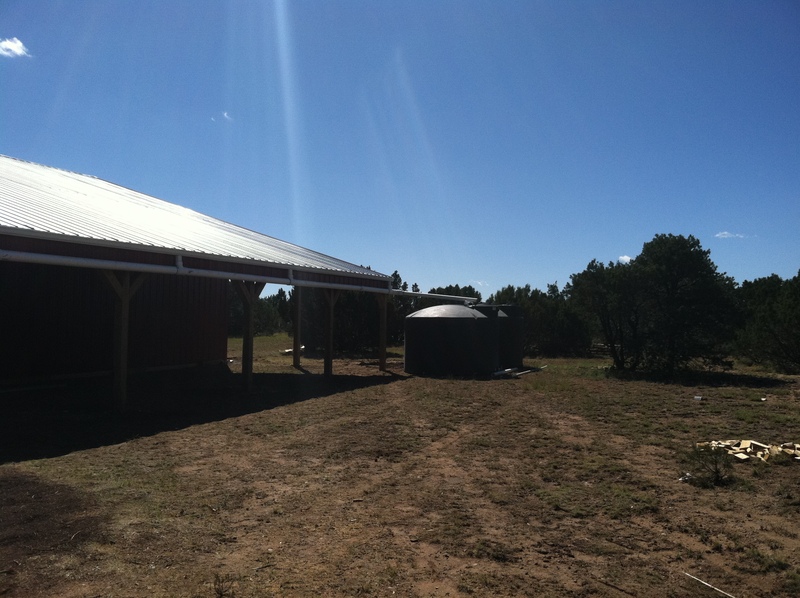 According to Bill, who knows the formula, our capacious roof should be able to collect 800 gallons of water from one inch of rain or ten inches of snow melt. Terrific! 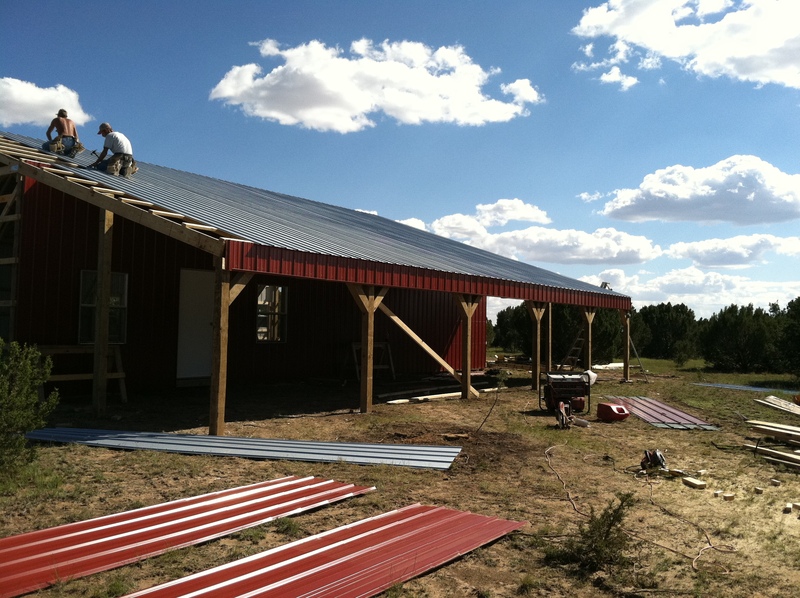 My goal has been to get the catchment in place before the winter snow in the hope of harvesting enough snow melt and rain to provide for the coming needs of earth floor construction and possibly a portion of summer retreat next year. 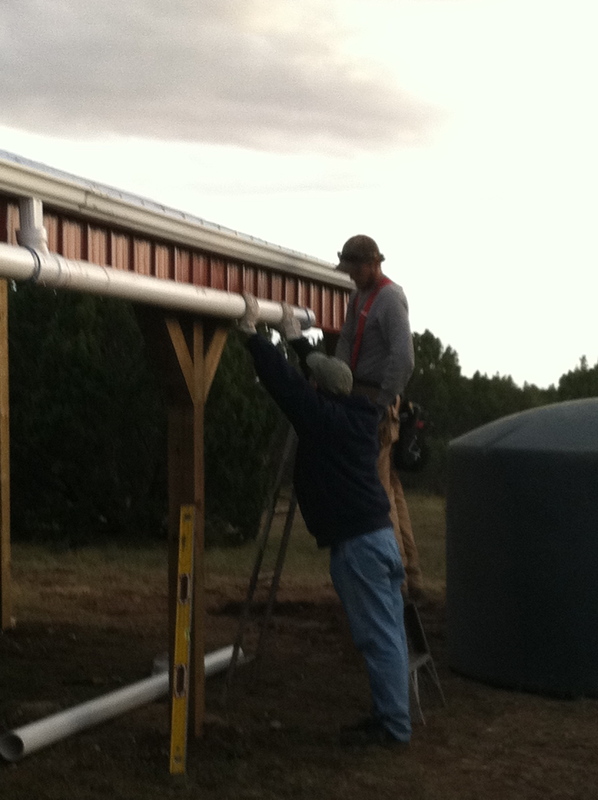 Ric and Jamie had two hours to get a large PVC pipe, mounted below the gutter for the gutter to drain into, as well as the fittings onto the cistern before the sun set. They worked steadily as the light dropped lower and lower. 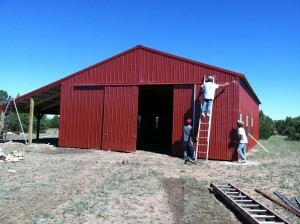 The final day on the barn is a day of finishing—edges & trims. All the doors and windows have been framed and installed except the slide doors, which lie in position on the ground at the south end, ready to be hung. Tim gathers tools, piling leftover lumber, propanel, and insulation as Steve and Juany measure and mount the slide door track. They all stop and smoke a cigarette around noon. I walk around, inspecting, asking final questions about the bottom edge of the west wall which doesn’t touch the ground. Steve nods. “See it touches on the east side. The ground slopes ever-so-slightly which is why that side has a gap,” he explains. 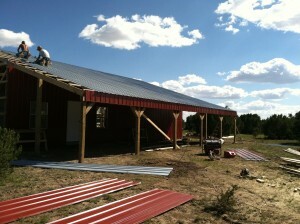 The barn is level and squared. I’ll have to seal around those edges before winter. I continue to inspect and see nothing to complain about. 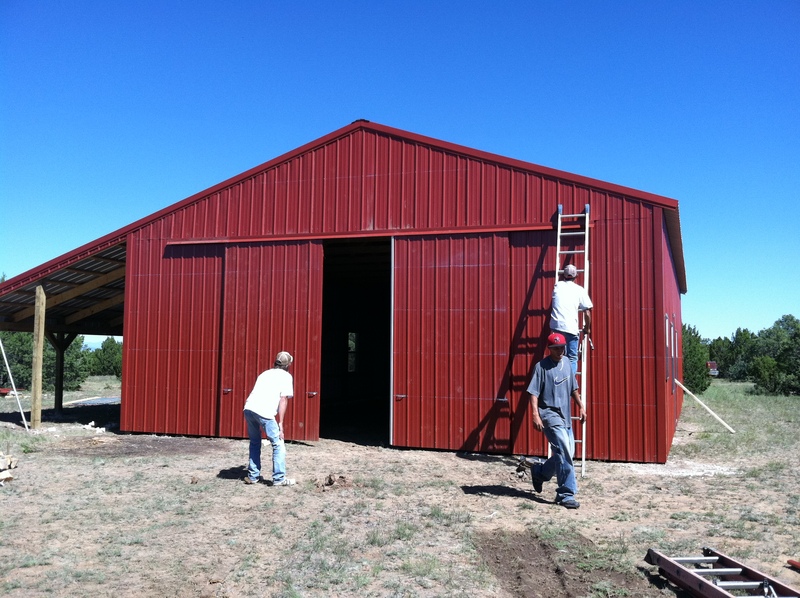 The barn is clean and sharp and wonderful. They grind out their cigarette butts, heave up the first slide door, working it onto its track. Then the second. Jauny shoves them together. Thunk! He gestures to the door, like the circus lion tamer, “Fits snug as a glove!” And it does. The barn is done. They will go now and I feel both sad and relieved. It’s been a consuming five days; I can use a digestion period. We shake hands. I give them the second half of the payment, a small tip each, a box of Chocolate Chip Oatmeal cookies for the ride home, and to Junay for his birthday, a set of antelope antlers I found on a hike. I wave them off and stand in stunned silence. Has this really happened, this thing that six weeks ago was phone calls and internet digging? Did I really find Wilson Pole Barn Company, research them, vet them, put in an order, transfer money from one account to another, send in the first half payment, fly out to the mesa and find the site, locate a jackhammer and a hauling tractor? Me, a dancer, who knows nothing of all this? Yes. I did. I cry as I imagine myself managing to do this, choosing it, learning it, and moving forward instead of thinking I can’t, or getting stuck, or saying that I’ll do it later. 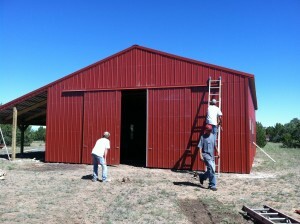 It is a beautiful barn. A perfect barn. 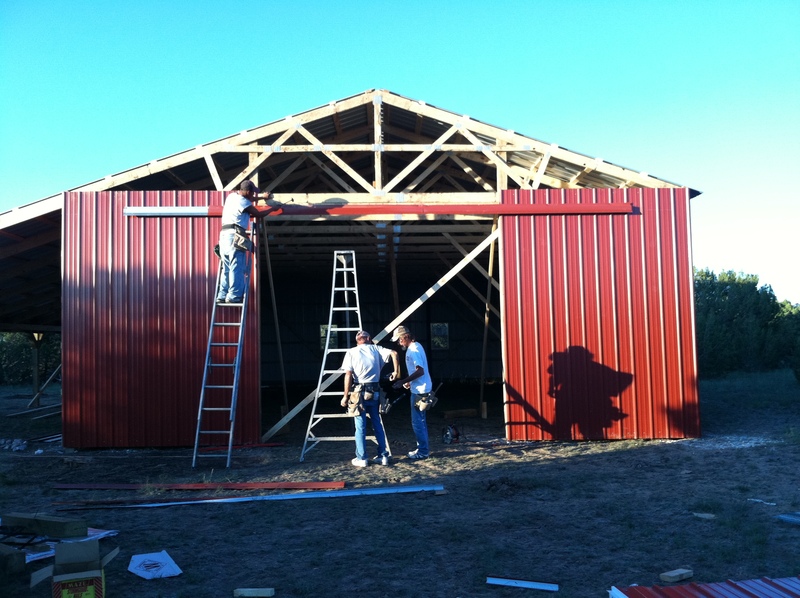 I feel such affection for the wonderful crew (Wilson Pole Barn specialists out of Wagoner, OK) who hammered in every nail by hand.